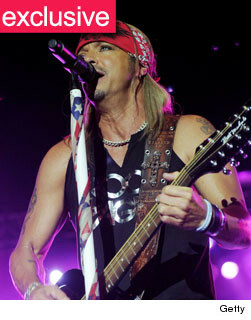 Bret Michaels: Free Concert Tickets for NY Police & Fire Departments! Bret Michaels fans at tonight's concert may want to behave themselves a little more than usual -- there's going to be a lot of police officers in the building! toofab has learned the rocker is honoring the New York Police and Fire Departments by giving out free concert tickets to local precincts for his show tonight in Westbury, NY. Over the past week, Michaels and his team have been distributing tickets to local officers and firefighters who want to go, free of charge. A rep for Bret tells toofab "This historic show at Westbury will serve as a tribute to and acknowledgement of all of the sacrifices our police officers and firemen make to keep us safe, and the daily acts of courage they perform in their line of duty." "Michaels hopes to give back to them, however he can, for their brave efforts," the rep adds. This isn't the first time Bret has given back to local heroes. He recently helped his cousin Doug, a police officer, raise money so his hometown of Butler, PA could purchase a pair of K9 dogs for the city.